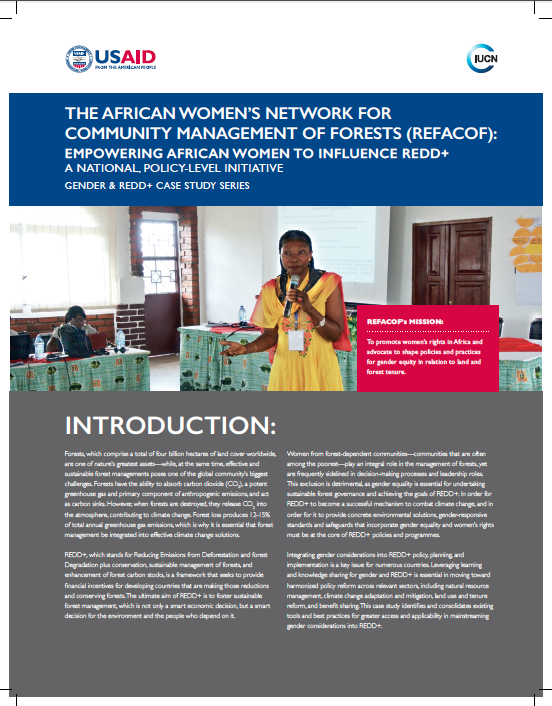 The African Women’s Network for Community Management of Forests (Réseau des Femmes Africaines pour la Gestion Communautaire des Forêts, or “REFACOF”) aims to make concrete, meaningful, and effective contributions to forest governance in order to influence national policies and international frameworks regarding women’s rights and tenure in member countries. Under African customary law, women seldom own or inherit land, and the only way they can access it is by marriage or through their male children. Through advocacy work, REFACOF has been able to propose articles and forest policies to the Government and to the Parliament that include women’s interests and ultimately will secure women’s rights in forestry and natural resource management, as well as REDD+ in the coming years. The lack of collective action amongst women’s organizations was a pressing issue that led to REFACOF forming strategic country and regional level development interventions. By strengthening women’s networks and partnering with men so they can advocate for comprehensive gender equality, which benefits broad community wellbeing, REFACOF has made it clear that inequitable situations are not an option.